The atmosphere of a celestial body slows the movement of any object passing through it, a force known as atmospheric drag (or simply drag). An atmosphere also allows for aerodynamic lift. The celestial bodies with atmospheres are the planets Eve, Kerbin, Duna and Jool, as well as Laythe, a moon of Jool. Only Kerbin and Laythe have atmospheres that contain oxygen and thus produce intake air for jet engines to work. Atmospheres allow aerobraking and easier landing. However, an atmosphere makes taking off from a planet more difficult and increases the minimum stable orbit altitude. where p0 is the atmosphere's pressure (Pa) at altitude 0, and H is the scale height (m). The scale height of an atmosphere define at which rate the pressure drops with altitude. In the case of Kerbin's atmosphere, the scale height is about 5600m and means that the atmospheric pressure will be 2.718 times smaller each time you go 5600m higher. where R is the specific gas constant equal to 287.053 J/kg-K. Note that for Kerbin atmosphere, the pressure and temperature are modeled to match Earth atmosphere by using U.S. Standard Atmosphere (USSA) equations (see Kerbin atmosphere). 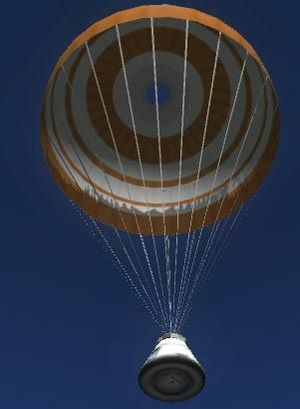 A Mk1-2 pod with a Mk16-XL parachute being slowed by drag in Kerbin's atmosphere. In the game, the force of atmospheric drag is dependent on the shape of a part and which of the part's attachment nodes are in use. For example, nose cones reduce drag on the part to which they are attached. A debug-mode option allows you to see the exact drag force on a given part by right-clicking on it. where ρ is the atmospheric density (kg/m3), v is the ship's velocity (m/s), d is the coefficient of drag (dimensionless), and A is the cross-sectional area (m2). The atmospheric height depends on the scale height of the celestial body and is where 0.000001th (0.0001%) of the surface pressure remains. Therefore, the atmospheric pressure at the edge of the atmosphere is relative; for example a craft in orbit around Jool can have a lower orbit (relative to the surface) because the surface pressure is higher. The terminal velocity of an object falling through an atmosphere is the velocity at which the force of gravity is equal to the force of drag. 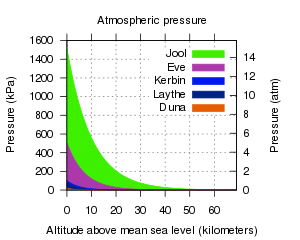 Terminal velocity changes as a function of altitude. Given enough time, an object falling into the atmosphere will slow to terminal velocity and then remain at terminal velocity for the rest of its fall. It describes the amount of velocity which a spacecraft must burn away when it is close to the ground. It represents the speed at which a ship should be traveling upward during a fuel-optimal ascent. where m is still the ship's mass, G is the gravitational constant, M is the mass of the planet, and r is the distance from the center of the planet to the falling object. The terminal velocity can be found by finding for what speed FG is equal to FD. The terminal velocity for an given imaginary body depends from the altitude on the different celestial bodies.